Bourne captain Peter Morgan in action. Peter has been a long-staning fixture at the Bourne helm, but Jamie has replaced wicket-keeper Dave Sargeant in charge at Market Deeping. Jamie Morgan captains Market Deeping this season. There was little to choose between the clubs last season as Bourne finished just a point and a place ahead of their neighbours in mid-table. The news season starts tomorrow (April 20, noon) when Bourne host Sleaford and Market Deeping entertain Lindum. Neither is likely to challenge perennial winners Bracebridge Heath for the title, but Peter believes his side will finish in the top three even though they have lost Lincolnshire Minor Counties captain/wicket-keeper Carl Wilson to Premier Division rivals Grantham. 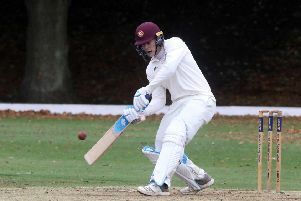 Teenage talent Joey Evison will also play his club cricket away from the Abbey Lawns. Evison, who is in the Nottinghamshire Academy, has moved to Notts Premier League club Plumtree. Hong Kong international Courtney Kruger will be the club’s vice-captain and overseas player, replacing Quewin O’Connor in the latter role. Deeping should stay clear of trouble especially as they have retained the services of Sri Lankan slow bowler Sachithra Perera. Perera claimed 60 Premier Division wickets in his first season in the competition in 2018, 16 more than any other bowler. Top-notch wicket-keeper Sam Malton has also returned to the club, but Deeping legend Dave Gillett’s availabity could be restricted by an aching body. Ins: Stephen Crossley Courtney Krugar. Outs: Carl Wilson, Joey Evison, Quewin O’Connor. One to watch: Sam Evison is an entertaining batsman and decent slow bowler. Club comment: “We should finish top three,” said Morgan. Swanny’s verdict: Top half at best. Ins: Kieran Judd , Sam Malton. One to watch: Judd could be an oasis of calm among a frenetic top order. Club comment: “It’s a young team, but we will play positively,” said club stalwart Dave Gillett. Swanny’s verdict: Will finish below Bourne. Rutland Division One starts on Sunday (April 14) with a game between Northants Premier Division rivals Oundle Town and Peterborough Town at Milton Road (1pm). Cambs take on Essex seconds in a friendly at Broxbourne on Sunday. Peterborough Town skipper David Clarke and new clubmate Josh Smith are set play as are Oundle Town brothers Conor and Harrison Craig. Cambs: J. Williams, D. Clarke, C. Craig, H. Craig, W. Hussain, J. Smith, B. Chilverd, J, Bowers, Z. Akhtar, W. Hussain, B. Harris. Spalding start the defence of their South Lincs Premier Division title at home to Graves Park tomorrow. South Lincs Premier Division (1pm) - Long Sutton v Boston 2nds, Sleaford 2nds v Bourne 2nds, Spalding v Graves Park. South Lincs Division One (1pm)- Welby Cavaliers v Baston. Friendly: Peterborough Town v Wollaton. Rutland Division One - Oundle v Peterborough Town; Division Four East - Wisbech 2nds v Long Sutton. Friendly - Cambs v Essex 2nds (at Broxbourne).